Last week we looked at how easy it is to import GeoJSON data into SQL Server’s geography datatype. Sometimes your source data won’t be perfectly formatted for SQL Server’s spatial datatypes though. Today we’ll examine what to do when our geographical polygon is showing us inverted results. Watch this week’s vlog on my YouTube channel. If you look at the state of Colorado on a map, you’ll notice its border is pretty much a rectangle. Note: four points + one extra point that is a repeat of our first point – this last repeated point let’s us know that we have a closed polygon since it ends at the same point where it began. WHY IS MY POLYGON AREA INVERTED?!!??! Discerning eyes might notice that SQL Server didn’t shade in the area inside of the polygon – it instead shaded in everything in the world EXCEPT for the interior of our polygon. If this is the first time you’ve encountered this behavior then you’re probably confused by this behavior – I know I was. 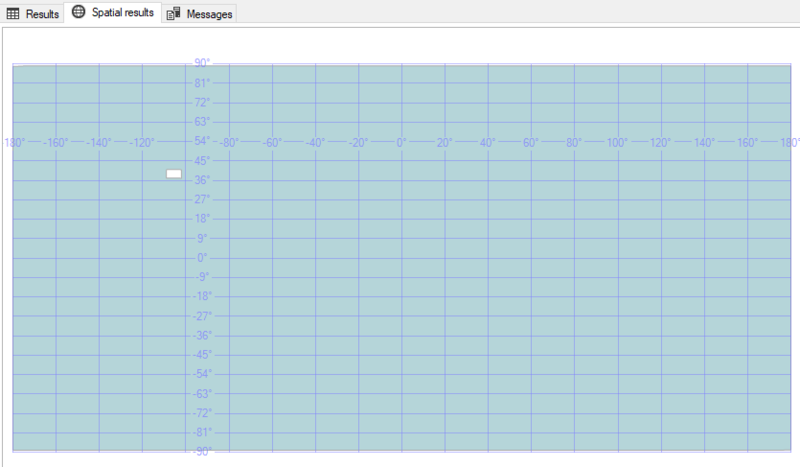 There is a logical explanation though for why SQL Server is seemingly shading in the wrong part of our polygon. The left hand rule works like this: imagine you are walking the path of polygon – whatever is to the left of the line you are walking is what is considered the “interior” of that polygon. If you imagine yourself walking along this line in the direction specified, you’ll quickly see why SQL Server shades the “outside” of the polygon: following the left-hand rule, everything except for the state of Colorado is considered the interior of our polygon shape. So the problem here is that our polygon data was encoded in a different direction than the SQL Server geography datatype expects. This is pretty easy to do with a polygon that only has five points, but this would be a huge pain for a polygon with hundreds or thousands of points. So how do we solve this in a more efficient manner? Easy, use SQL Server’s ReorientObject() function. ReorientObject() does what we did manually above – it manipulates the order of our polygon’s points so that it changes the direction in which the polygon is drawn. Note: SQL uses a different order when reversing the points using ReorientObject() than the way we reversed them above. The end result ends up being the same however. Thank you for the clean simple explanation. You’re welcome Meher, thanks for reading!